Coral have gone mad! They are offering an unmissable £1 completely free bet on the Grand National. You just need to register/login via our special link! Sign up with Coral today and bet on the Grand National without even deposit! 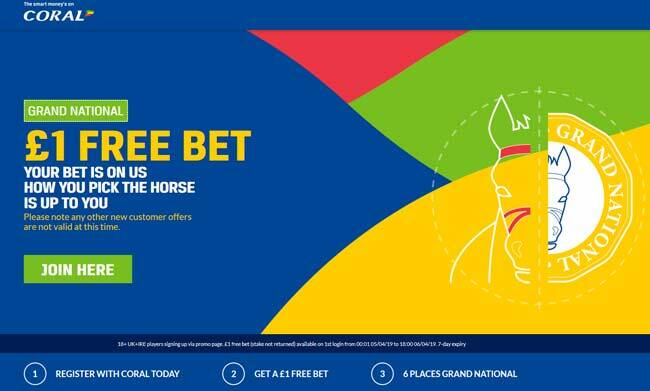 Coral offer £1 no deposit bonus on Grand National Day! All of you who haven’t already joined Coral can do so and claim the £1 no deposit bonus on the Grand National! 3) Coral will credit your account with a £1 no deposit bet to wager on the Grand National! 18+ UK+IRE players signing up via promo page. £1 free bet (stake not returned) available on 1st login from 00:01 05/04/19 to 18:00 06/04/19. 7-day expiry. Don't you know how to bet on the Grand National? Read our guide! This sports promotion is available to new and existing customers at Coral’s discretion from 00:01 UK Friday 5th April to 18:00 UK on Saturday 6th April 2019. This sports promotion is open to new and existing customers aged 18 years or over with accounts registered in the UK&/or Republic of Ireland, betting on the mobile app. This sports promotion is not available to customers who open new accounts depositing funds with PayPal Moneybookers, Paysafe, Neteller or Skrill. To claim this sports promotion, log into your account between 00:01 Friday 5th April 2019 and 18:00 UK on Saturday 6th April. Upon login, your account will be instantly credited with a £1 Free Bet to be used on any sports market. This promotion is available to the first 100,000 customers per day of offer. Once this limit is reached the offer will end. Your free bet will expire after 7 days. Maximum free bet for this offer is £/€1 per customer. Maximum 100,000 customers will qualify for this offer. You cannot Cash Out your free bet/s. The same Maximum Pay Out restrictions set out in our General Website Terms & Conditions [LINK TO - https://help.coral.co.uk/s/article/Terms-and-Conditions] will equally apply to this Sports Promotion. Bet £10 at Coral, get a Retro Football Shirt! Turn £1 into £1,000,000 with the new Coral Football Jackpot. Learn how to play here! "Grand National No Deposit Free Bet: Get £1 FREE When You Join Coral"